In the space of an hour last Saturday, two things happen. First, I meet a woman whose last name is Lucky, and then I draw my own name out of a basket full of small slips of paper and win a lovely bracelet as a door prize. I’ve gone my whole life without meeting someone named Lucky (even if she married into the name), so I don’t know how to figure the odds of that. But when I draw my own name, it’s in the middle of 30 or 40 other pieces of paper. I’m sitting on a stair step, and the basket is higher than my head. There’s no way for me to see what name I’m drawing. And yet, improbably, I pick my name, soon after meeting Mrs. Lucky. Later that night, after a nice dinner with friends, I drive up the casino to play poker. It’s a slow night, and off in some way that I couldn’t quite put my finger on. Which may have been the reason why, on a Saturday night, the place was pretty quiet. Still, I had driven all the way up there and might as well stay, so I take a seat at my favorite limit hold ‘em game. I laugh and shake my head. Not in this lifetime, I think. “No, no, there’s not a game outside this poker room that I would bet a single dollar on,” I answer. The whole table is listening, and I’m aware that I’m clearly labeling myself as Not a Real Gambler. I shuffle two stacks of eight red chips, a habit, and look up at him again. “Listen, maybe if I knew how to play those games – who knows? – I might have a different opinion. But I do know this. They’re house games.” Why play when the odds aren’t in my favor? Later on, I couldn’t help wondering, can I ever really win big, if I play like that? 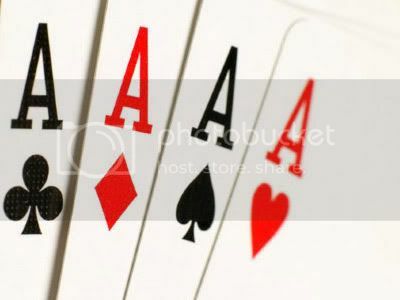 Not in poker, but in my life? If I only play games where I know I’m safe, where I won’t win much, but I won’t lose much either, where does that leave me? I’ve had a couple of days now to think about those questions. I’m absolutely sure of my rules about playing other casino games (not going to happen), but what about the other chances I’m not taking? Would I rather absorb the small losses, a little bit at a time (and end up with nothing to show for it – no book, no published articles), than kiss the dice and pray to roll a lucky seven? If life is a game, why am I not betting on me? I become almost paralyzed by fear – equal parts fear of failure or of success. Both are scary. But scary is good, when it’s the right thing (yes? ), when what you might win is the thing you wanted all along. That’s what I hear, anyway. I’d kind of like to find out for myself, to know if I have what it takes to back up my bluffs. But as for the rest of it, for those dreams that would put us over the moon if they came true, it takes work to be ready when everything comes together and luck somehow finds the right address. It’s time to do that work. To draw my own name, again. Fear is a fickle mistress. Sometimes she prods us on and sometimes she just paralyzes us with her taser. I hope that you are being prodded on to greatness. RiverPoets last blog post..My Blog-iversary! Really? You need the answer to this question? How about the fact that you weren’t raised to believe in you? How about the fact that you DID have to make your own luck long before you should have had to? How about the fact that you didn’t have a proper foundation of love and support, or someone to teach you that you’re WORTH betting on? How about that? I love that you ended this with “deal me in,” but don’t think that I don’t know the work you had to do to get to this place. Thank you for this post. That’s all I can really say. Autumns last blog post..Ramble, Ramble, Ramble…. I’m betting on you – it’s about as close to a sure thing as you get. Werent you the one who said not making a choice is making a choice (or words to that effect)? I think you have to deal yourself in, but you can do that. Deal yourself in. You can think about it on the 4-mile loop. Yes, you put yourself out there and the luck finds you. Maybe it’s because you have a healthy respect for risk vs. gain – if he had said “bet $50” instead of $500 – would you have taken the chance to step out of your comfort zone? There’s nothing wrong with hedging your bets. Ems last blog post..Um, thanks, but no thanks, Heidi. I figure, “luck” is just someone else’s reason for why you have it so much better than they do. I’m not one to bet, but I would certainly place my bets on you. But seriously, five hundred dollars is a lot of bones. I’d bet on you though. Let ’em roll, honey. And please, tell us this works out for you…I need a happy story right about now. What Em said. Both times. Easier when you’re 18 but still very possible. the mama bird diariess last blog post..you have election anxiety and i have the cure. Society tends to minimize the individual. We aren’t taught to gamble with our lives. We are taught to be conservative, yet awe at the people that take the risks and win big. Age and wisdom have taught me to gamble, but not with money or power, but with my own convictions and test myself every day (or at least try to). I’d love to see this as the beginning of a journal/blog detailing your success and failure at the risktaking you’re talking about. ByJanes last blog post..Where oh where has my allergy medicine gone? I get where you’re coming from. Taking chances and risking to follow your dreams is scary stuff and I think it is about failing and getting back up more than luck. Look at the great hitters in baseball – Barry Bonds leads with 762 career home runs but he has had 1539 strike-outs. To be great in sales you hear something like 10 no’s before a yes. It’s believing in yourself no matter what the odds. You ARE a winner – you already have defied the odds. Now all you have to do is claim what is yours. Lindas last blog post..A little obsessed…maybe? Love this. I am a firm believer in making luck. Wish my name was lucky. This is a pretty amazing piece of writing, J.
It’s hard to take that leap of faith, isn’t it? If I never put myself out there, I never fail…but I also never really know what I can do. Intriguing thoughts for my weekend. I’m betting on you, beautiful!! Hey…I may be having a brain dead moment, but I have an award over at my site for you.